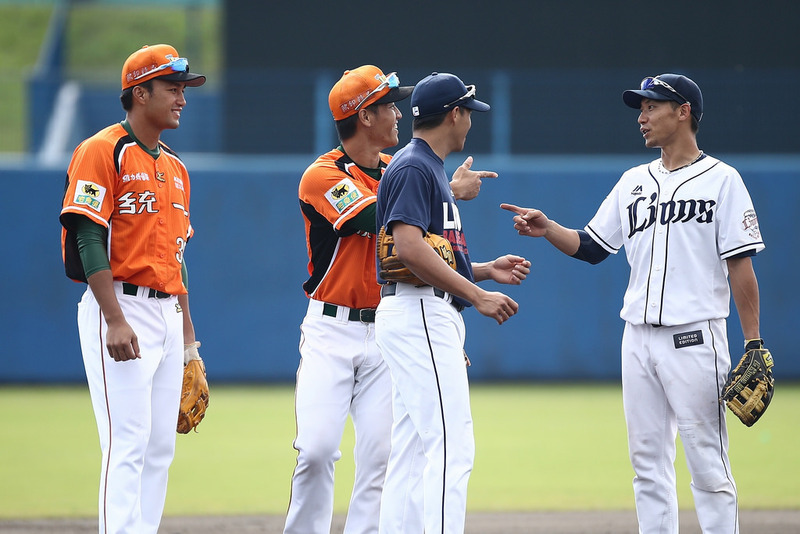 As we all know, CPBL is a lot of fun: plenty of hits, nice long games, and bags of personality from the players, coaches–and even the umpires. However, if you don’t speak Mandarin, following a broadcast or talking with friends at a game can occasionally be a challenge. With this in mind, we’ll be presenting a short series on useful phrases to help you learn all the key phrases you’ll need to follow the game a little more closely. You’ll notice the diacritics, or marks above the letters. These show the tones used in Mandarin. For listening, you probably don’t need to worry about them, but if you’re keen to practice speaking, see if you can follow them. Below is a handy guide on tones. When watching baseball “bàng qiú” / 棒球 (literally, “bat ball”) you’re likely to hear the same phrases over and over again. When watching a game, or “bǐsài” / 比賽, a lot of these phrases will, as you might expect, be based around numbers, so although they’re not the most exciting words to learn, they’re certainly very important. Master these, and your foundation will be strong. Watch out for “two”, however: when it’s used to count things like runs and balls, it has a different character, (兩) and is pronounced “liǎng”. This shouldn’t be confused with the word for zero, which is “líng” / 零. Numbers beyond 10 are also pretty common in CPBL, but they’re also pretty easy: to make 11, you just say “ten-one”, (“shí yī” / 十一）and so on, while 20 is “èr shí” / 二十， or “two tens”. Okay, so have you got the numbers? If not, here’s a video. This is also helpful for those keen to learn and practice the tones. Let’s now put them to some use. The words for bases in Mandarin are really easy, as they simply combine the numbers above with the word “lěi” / 壘 (think of the base lying down if that helps). So “yī lěi” / 一壘 is first base, and “èr lěi” / 二壘 is second base, meaning that third base is…(look at the numbers if you need to…) Right! It’s “sān lěi” / 三壘. Home plate is a little different, though, and is “běn lěi” / 本壘, with ‘běn’ meaning ‘base’ (as in home) or ‘origin’. You can also apply the same logic to the innings, or “jú” / 局. So the second inning is “èr jú” / 二局, and the ninth is “jiǔ jú” / 九局. By now, you should have got a feeling for it, so we’ll add two new words: “shàng” / 上 and “xià” / 下, meaning “top” and “bottom” respectively (also “on” and “below” in other situations). This means that the top of the fourth inning is “sì jú shàng” / 四局上, and the bottom of the third is “sān jú xià” / 三局下 (plus any other combination you can think of). Right! It’s “on base”. As you can see, as with a lot of words in Mandarin, once you know the parts, it’s all pretty straightforward. As we’ve already seen, bat is “bàng” / 棒, and we have the numbers 1-9 down, too, so to discuss batting order, we need to add the order word (like 1st, 2nd, 3rd, 4th etc): dì / 第. First in the lineup is referred to as “first bat”, or “dì yī bàng” / 第一棒, and so on until “dì jiǔ bàng” / 第九棒… which you’ll already have figured out is ninth in the order. Here are some words that might come up in future lessons, but which you’ll also hear all the time. Try to learn these, too! You can also review these words with our quizzes on Quizlet. There are two versions: one with English and pinyin, and the other with English and hanzi. 加油! Taiwanese Mandarin speakers often pronounce the ‘zh’ sound so that it sounds more like ‘z’, and ‘sh’ like ‘s’. It’s not too important, but it might help. Because many player (and other Taiwanese names) names are Romanized using the Wade-Giles system, things can seem confusing. For example, the character 中 is written as “Zhong” in pinyin, but “Chung” in Wade-Giles. (One recent example: 王柏融, who many will know as “Wang Po-Jung” is written according to Wade-Giles. Pinyin would have him as “Wang Bo-Rong”.) Neither is wrong, but if in doubt, aim for the middle. Joe-Joe is our Japan-based contributor and the resident music expert. Apart from supporting the Tokyo Yakult Swallows, he is also a fan of the CPBL. You can follow Joe-Joe on Twitter @homerunbunt, and also check out his band Merry Christmas. Good spot, I’ll amend that shortly!